Vineyard Adyar, established in 2003, participates in our annual international organic wine award on a regular base, belongs to the bio-pioneers of the country and one way and another, appears in an unusual way. 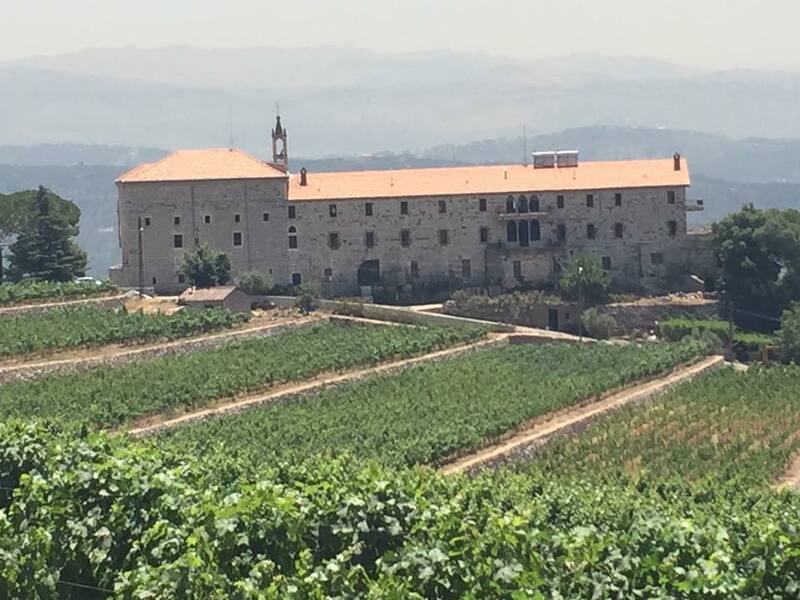 In addition to the great rarity of Lebanese wine over here, Adyar is a cooperative of 8 monastic vineyards of the Lebanese Maronite Order, established in 1695 and dedicated to preservation of ancient winegrowing tradition and protection of the entrusted terroir. We wanted to learn more about this young and at the same time very old establisment, therefore we asked Mr Frederic Cacchia, Adyar’s winemaker, to give us an interview. Mr Cacchia, why did you decide to live and work in Lebanon? Did you have a certain connection to the Lebanese Maronite Order or was it a plain “job decision”? The first time I came in Lebanon was in 1999; I just got my diploma in oenology and was looking for opportunities. I came here for one month, during september, to get some experience. It was for a well-known winery, Massaya, in the Beeka valley. Finally, this company contacted me in 2000 to come back and take the full responsibility for the winemaking. I finished my contract in 2003; because I felt in love with this country and the life you can have here, I tried to find a new opportunity. That’s how everything began with Adyar. No special connection, just at first a new project to develop. Referring to your website, we learned that Adyar works very traditional. What exactly does “traditional” mean to you in this context? Can you explain a little how winemaking works at Adyar? Even if today winemakers have a lot of technicals possibilities, I am convinced that wine is just the result of the grapes fermentation. That means for me two things are important: the grapes, that’s why we should be at first vine growers, because It is in the vineyard you make the wine. And because we are organic, you must be attentive to what the vines tell you. The second thing is the transformation of the grapes, and I think it should be as simple as you can. You should only go with your grapes, let them express their own personnality. In the fact, that means we don’t sfollow the custom of the day: no cold-maceration, no reverse osmose, etc…. Would you say that working in monastic winegrowing is surrounded by a special peaceful and meditative spirit, especially compared to conventional viticulture? I think “stressless” is the word. Because monks have “time”; when they do something, they do it for the whole community. That means they do it for the present day and the future. It is a long-time project. So we can take the time to do the right thing, even if It will take a long time to obtain results. Are people curious about your way of winemaking, i.e. do you have many visitors from Lebanon and abroad, who like to see the vineyards and to learn more about your work? Is there anything people are especially interested in? For many years now, lebanese people try to present a positive image of their country. Winegrowers take part in it, by many events around the world. So Lebanon is well-known in the wine-industry; It arouses the interest of journalists or wine-tour. There is another thing, maybe the most important too: most of the lebanese people are today outside their country. One of the link they keep with the country is through lebanese products they would buy, especially wine. So when they come back in their native country, they have a real interest to discover and visit the wineries. For Adyar, because the special place of the Maronites in the lebanese history, the interest is even more important. People come for the wine, but also for history and spirituality. How would you describe the relationship between the monasteries and the surrounding municipalities? Do you get local support for maintaining the old tradition of monastic winegrowing? It was one of the purpose of this project. In the past, monasteries used to have families on their land to help them in agriculture, farming, and the maintenance of the buildings. Because of the recent war, and rural exodus, families left. By proposing a project like Adyar, and all the work it will bring with, the idea was to help people to come back int their native regions and in the monasteries. What is the opinion of your local colleagues about organic certification? Do you think that it will continue gaining popularity in future? We were the first to get the organic certification. 3 small wineries followed our way. It is my personal opinion, but I think, for the others producers, organic agriculture needs a lot of work and the cost is very expensive. As they don’t really find any commercial advantage to go in it (the demand on organic products is weak), they’re still working in traditionnal farming. And they won’t change. Formed by the more recent history, many French grape varieties are cultivated in Lebanon. It is well known that Lebanese winegrowing tradition is far older than the French one. Do autochthonous varieties still exist in Lebanon? If yes, would you tell us a few words about the most important ones? History of Lebanese wine extends back, at the very least, to the Phoenician civilization. After the fall of the last Crusader empires, wine production decreased, as Muslim empires took control of the region. In this time, wine gave way to arak, a popular “anisette”. In the 19th, the Jesuit priests encouraged the return of winemaking; they imported vines from Algeria and France. Today, the lebanese vineyard is very different from the past; international grapes, like Cabernet-Sauvignon or Syrah, replaced original lebanese grapes (the most famous are Obeidi and Merwah, both white grapes). A few wineries try today to reintroduce Obeidi; It is less aromatic than chardonnay or sauvignon. With a low yield, you can obtain a fresh wine, that means with herbal aromas and a good acidity. I think It can be part of a blend. Many thanks for taking the time to do this interview. We wish you continuing success and look forward to the next Adyar vintages. Dieser Beitrag wurde unter Allgemein, English Posts abgelegt und mit Adyar, Frederic Cacchia, Lebanon, Maronite Order, organic wine, organic wine award verschlagwortet. Setze ein Lesezeichen auf den Permalink.